Based on 2015's stranger-than-fiction prison break, the critically acclaimed, award-winning Escape at Dannemora arrives on DVD April 16 from Showtime Networks, CBS Home Entertainment and Paramount Home Media Distribution. Garnering both Golden Globe Award, Critics Choice Award** and Screen Actors Guild (SAG) Award wins for her spellbinding performance, Patricia Arquette (Boyhood, Medium) joins Academy Award® and Golden Globe winner Benicio Del Toro (Traffic) and Paul Dano (Love & Mercy) in the "riveting and superbly acted" (TV Guide) limited series directed by Ben Stiller (The Secret Life of Walter Mitty). The three-disc collection features all seven episodes alongside special features that dive into the incredible true story behind the series, which also earned a Golden Globe nomination for "Best Television Limited Series." "One of the best series of the year" (Newsday) and also starring Eric Lange (Narcos), David Morse (John Adams, House M.D.) 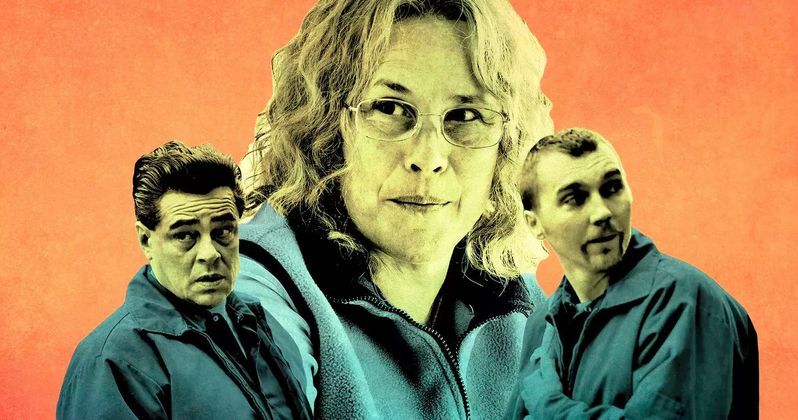 and Bonnie Hunt (Life With Bonnie), Escape at Dannemora follows the true story of two convicted murderers, Richard Matt (Del Toro) and David Sweat (Dano), who escaped Clinton Correctional Facility with the help of Joyce "Tilly" Mitchell (Arquette), a female prison employee. Tilly, a working class wife and mother who supervises the prison tailor shop and becomes sexually involved with the two prisoners, ultimately assisting them in their escape. Produced by Showtime®, Escape at Dannemora is directed and executive produced by Emmy® winner Ben Stiller. The series is written and executive produced by Brett Johnson (Mad Men) and Oscar® nominee Michael Tolkin (The Player), who met while working as writers on Ray Donovan. In addition to Stiller, Johnson and Tolkin, three-time Academy Award nominee Michael De Luca (The Social Network, Fifty Shades of Grey) via Michael De Luca Productions, Bryan Zuriff (Steve Jobs, Ray Donovan), Nicky Weinstock for Red Hour Productions and Bill Carraro (Blade Runner 2049, Terminator Genisys) serve as executive producers. The Escape at Dannemora DVD is presented in full frame format with English 5.1 Surround. • Primary Sources: A featurette that looks at the real life circumstances of the 2015 prison break from which Escape at Dannemora was based. • Making of "Sweat's Run": Episode five of Escape at Dannemora opens with a visceral 9-minute scene nicknamed by the crew, "Sweat's Run." What appears to be a single camera shot is, in reality, 17 different scenes across four different locations edited together. Director Ben Stiller, Production Designer Mark Ricker, Director of Photography Jessica Lee Gangé, and the Phosphene Visual Effects team speak to how they seamlessly stitched together those 17 shots to emulate David Sweat's real rehearsal escape through the bowels of the prison.